Christopher Boehm 2012. Moral Origins: The Evolution of Virtue, Altruism and Shame. Basic Books, New York. ISBN-13: 978-0465020485 Hardback. £18.99/US$19.22. Christopher Boehm, in his book Moral Origins: The Evolution of Virtue, Altruism and Shame, implicitly sets out to lift the veil from the deformed relations between human beings, to shed light on what our true social nature is, or rather, once was. Boehm is a social anthropologist who has also studied the behaviour of wild chimpanzees in the Gombe Stream National Park, Tanzania, made famous by Jane Goodall. He is Director of the Goodall Research Center at the University of Southern California, USA. He sets out in his book to trace the origin and development of humans’ social code of morals. Guided by Richard Dawkins’s notion of evolution by natural selection at the blind whim of “selfish genes”, Boehm ponders the origin of altruism and conscience in the broadest sense – but his exploration of this central feature of human nature and its origins during human evolution makes no mention of its distortion through the alienation inherent in a society in thrall to capital. Boehm’s central thesis is that humans share with the two species of chimpanzees to which we seem most closely related not only many genes but also some fundamental aspects of behaviour. These may stem from a common, long-extinct ancestral ape. What, he wonders, were the processes, times and places through which human attributes emerged? The issue of human nature is central to Marxism, and a topic that most people wonder about. Marx and Engels considered that what we are, and how we behave and interact with one another and with the rest of the natural world, is veiled over by the social and economic conditions under which all humans now live. In social relations that are dominantly engaged with capital, the separation of our labour from what we produce from the natural world is the source of an all-permeating alienation. …labour (human interaction with nature, to provide the means of subsistence and the basis for culture), has been deformed, i.e. turned into alienated labour, through a succession of hierarchical societies, of which capitalism is the latest. This has also deformed relationships between human beings (which are increasingly conducted as the relationship of things, exchangeable commodities) and the relationship between humans and nature (which is conducted not in a human way, but according to the dehumanised logic of production and exchange under capitalism). The labour process under capitalism at one and the same time forces people to engage in tasks that bear no relation whatever to their human needs, in exchange for wages, and also causes e.g. excessive greenhouse gas emissions, deforestation, or ruination of fresh water systems. On the surface, Boehm follows Marx and Engels in starting from the immediate knowledge of living humans and societies, and extant apes – but it soon becomes clear that his method diverges far from theirs. The germ of Boehm’s approach is that human social behaviour is dominated somehow by genes[i] and that it evolved in a dominantly Darwinian sense through the increased fitness[ii] that he believes its various aspects conferred. This is the approach of sociobiology,[iii] which plays down or ignores the influence on human behaviour of an individual’s social environment, including culture and each individual’s mark on society and culture. Boehm strays into more broken ground by applying some of his ideas to sociology and politics. A critique of his arguments demands a discussion of the evolution of humans and other apes, which makes up the first part of this article. The second part deals with Boehm’s view of the evolutionary mechanism. The third part challenges his genetic determinism and some of his ideas on modern society. As Charles Darwin insisted – and he has been proved correct – we belong anatomically to the Family of animals known as Hominidae: the great apes. Boehm has for more than three decades tried to work out what behavioural traits humans may share with other great apes, to which we are most closely related. It is now widely accepted, from the comparison of critical parts of our DNA with those in the genomes of other apes, that genetically our nearest living relatives are the two species of chimpanzee (bonobos or Pan paniscus, and common chimps or P. troglodytes). Researchers using genetic differences, and an estimate of the rate at which genes mutate, have sketched out a “tree” of relatedness, which suggests that humans and chimps descended from a common ancestral species between about 7 and 13 million years ago. This “Ancestral Pan”, as Boehm calls it, split earlier from a “branch” that eventually led to gorillas. Yet further back there was a genetic divergence from the ancestors of south-east Asian orang-utans. [iv] The beings thought to have led towards modern humans are known collectively as hominins, and a major omission from Boehm’s treatment of evolution is that he barely refers to those earlier species. In fact Boehm considers a chimp-human divergence 5-7 million years (Ma) ago[v] that was generally accepted when his book went to press. A revision to 7-13 Ma was found necessary at the time he was writing, because new work on the rate of random mutation in human and presumably hominin DNA found it to be significantly slower than previously thought (end note 4). The resultant pushing-back in time of the departure of human and chimp evolution from a common ancestor has major implications for understanding the course of hominin evolution, and indeed that of chimp forebears. Indeed it may seriously undermine that part of Boehm’s discussion that relies on reconstructing the behavioural modus operandi of his “Ancestral Pan”. Boehm uses the principle of parsimony[vi] to reconstruct the social behavioural system of “Ancestral Pan” from those of chimps and surviving human hunter-gatherers. He also discusses an earlier ancestor common to humans, both species of chimpanzee and gorillas, observing that all four live in social groups that separate themselves from other such groups. The diet of each contains substantial amounts of vegetable foods. In his view, all are known to attack other members of the same species that belong to territorially different social groups. His hypothesis is that this inferred ancestral social system was centred on the innate dominance of “alpha” males, which remains among chimps and gorillas, yet is largely absent from living human hunter-gatherer groups. As regards interactions between males and females, and care of infants, there are great differences between humans, gorillas and both chimpanzee species. Gorilla groups have a single dominant male with exclusive breeding “rights” with all females in the group; other adult males are excluded through alpha-male aggressive display or violence. Males of both chimpanzee species are sexually promiscuous, alpha males tolerating the presence of other adult males but aggressively enforcing their own sexual primacy. Infants of these three species are reared entirely by their mothers and sometimes jointly with other females. Humans generally form long-term pair bonds with both partners each taking an active though not necessarily equal share in infant care. It hardly needs stating that, as well as being habitual upright bipeds with many other physiological differences from other living apes, what sets humans far apart from other apes is that we conduct our social and individual lives with a degree of self- and social consciousness that far transcends any that apes may show. them have arisen during each species’ evolution. It has to be stressed that just what those distinguishing genes are, where they reside in DNA and how they function is by no means fully understood. Some major differences in behaviour, such as the general tendency for long-term pair bonding among humans and our lack of general alpha-male dominance, can be ascribed with some certainty to genes that arose during our evolution, for a reason set out in the next section. Pair bonding, and a significantly lesser tendency among human males than in other apes to take on the trappings of “alphas”, seem to be related to two important physiological features that can be sought in fossils. 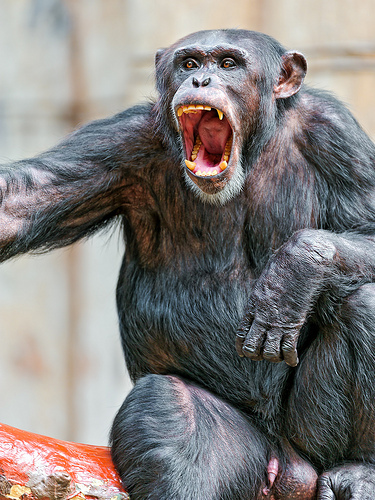 A clear sign of a genetic tendency to male dominance, alpha males’ near-monopoly of breeding and a marked social hierarchy among males in dominantly vegetarian monkeys and apes lies in their teeth. Probably the most extreme example is in the wholly vegetarian baboon (a monkey not an ape), whose males have canine teeth that rival those of “big cats”, while female baboons are very much less well-endowed. The same sexual dimorphism[vii] is seen in orang-utans, gorillas and both species of chimpanzee. The teeth of humans show no such difference, neither males nor females having highly pronounced canines. That is despite humans having by far the highest proportion of meat in their diet of any primate. Another sexual dimorphism is that of size: males of the four living apes most closely related to us are very much larger than females. A difference is present in humans, but is far less pronounced. This feature is generally agreed to be connected to humans’ tendency to form long-term pair bonds. [viii] There can be little doubt that both teeth and stature are genetically controlled. So, is there any way of judging when both these marked human divergences from other apes took place? These differences, and when they may have arisen, are issues that Boehm ignores completely. The oldest known fossil hominin was found in Chad by a French-Chadian team in 2001-02 in sediments that they dated at around 7 Ma. Colloquially named Toumai (“hope of life” in the Dazaga language), a single cranium, five pieces of jaw and some teeth have been assigned to Sahelanthropus tchadensis. Toumai’s braincase is around 350 cc in volume, compared with 1350 cc for a modern human. Its brain was about the same size as that of a chimpanzee. Experts agree that this being walked upright, since the feature at the base of its skull where the cranium joined the spine – the foramen magnum – is located significantly nearer the front than in knuckle-walking apes. Since upright walking is part of the definition of the hominin group, all later fossils assigned to it show some evidence that supports a two-legged (bipedal) gait. In view of Boehm’s thesis, a very important feature of “Toumai” is that it did not have prominent canine teeth. In fact every hominin cranium and jawbone from later geological times – from australopithecines and other early hominins, and all those assigned to our genus Homo – do not show this quintessentially threatening kind of dentition, which in other, mainly vegetarian, primates is ascribed to strong genetic selection for male dominance. The new estimate of 7-13 Ma when evolutionary paths leading towards humans and both living chimps diverged has opened up an entirely new approach to our origins: fossils much older than Toumai come into the reckoning, and one is very interesting in two respects. In 1950 an almost complete fossil of an extinct primate, Oreopithecus bambolii, was discovered in 7-9 Ma old Italian sedimentary rocks parts of it having been described as early as 1872, a year after publication of Darwin’s The Descent of Man. In the human evolution story, Oreopithecus was overlooked until the 1990s. This creature was able to walk upright and is clearly an ape of some kind. Perhaps significantly, it too lacks signs of enlarged canine teeth. Though not from Africa, it is now regarded by some specialists as a candidate for the common ancestor of humans and chimps. This possibility is not mentioned by Boehm, and undermines his reliance on “Ancestral Pan” as a link between chimpanzee and human behaviour. Another issue that has emerged from recent re-evaluation of human ancestry is that chimpanzees may be specialised descendants from a common ancestor that was perhaps very different from either chimps or humans (see Harmon, end note 9). Indeed, chimps are restricted to forest ecosystems, whereas humans and hominins since about 3.5 Ma inhabited much more widely distributed savannah grasslands and open woodland. Fossils of chimpanzees are elusive, which may reflect their having occupied tropical rain forest exclusively since the 7-13 Ma split. (Rain-forest conditions of wet, acid soils are notorious for yielding few fossil bones of any age.) It is quite possible that chimpanzees are the survivors of a lineage specialised for rain-forest life. Hominins, on the other hand, spread throughout Africa, becoming generalists adaptable to a range of ecosystems. Their common ancestor with chimpanzees could have been a widespread, adaptable species – we simply do not have the fossils to tell – from which ancestral chimps branched off to specialise in forest life. Based mainly on genetic similarities between living species that have evolved over around 7-13 Ma, it is surely a misuse of the term “parsimony” to attribute behavioural characteristics to any common ancestor. Shared physiological traits are needed as minimal confirmation, which is totally absent in the case of enlarged canine teeth since 7 Ma ago. The size difference between males and females of one species, usually ascribed to male dominance and competitiveness for mating rights, also has an interesting history among hominins. The further back in time one goes, the more difficult it is to find skeletal parts that distinguish male and female individuals convincingly – but, nevertheless, all the early candidate species for inclusion among the hominins, the australopithecines and paranthropoids,[x] do show clear sexual dimorphism, in some cases more extreme even than that among gorillas. The oldest member of our genus, Homo, with enough fossil material to judge the level of sexual dimorphism is Homo ergaster from Africa, dating back to 1.9 Ma. The species spread to East and South Africa, used tools and invented new ones, and was the first hominin known with certainty to have migrated out of Africa shortly after first appearing. Its males and females from one group were as close in size as are modern humans, although it seems there was a range of statures between groups and regions. hominins. It can therefore be argued plausibly that, for about 2 Ma, humans have formed pair bonds and males have not competed for breeding dominance to the extent seen among chimps, gorillas and orang-utans. Another very noticeable difference between all living and fossil humans on one hand, and living apes, australopithecine and paranthropoid hominins on the other, is their gut size. Humans have noticeable waists, the others do not and are obviously “pot-bellied”. It seems that around 2 Ma ago something changed in our diet, and digestion no longer required the large guts of earlier hominins and other living great apes. Some consider this to mark an increase in consumption of meat or the discovery of more easily digested raw vegetable matter, perhaps roots and bulbs. Others have hinted at cooking, though the first clear evidence for the controlled use of fire – burned bone and vegetable matter associated with stone tools in caves – does not appear in the geological record until around 1 Ma ago in South Africa. Hominin remains are found over large areas of Africa, and evidence of migration of our “tooled-up” forebears across Eurasia starts from the 1.8 Ma occurrence of a species of Homo in Georgia.Studies of the chemistry and wear-patterns of hominin teeth show that they were omnivorous, and able to eat and digest fibrous vegetation and bark as well as leaves, shoots and fruits. A variety of evidence shows that they introduced meat to their diet at an early stage. There can be little doubt that part and parcel of being hominin, as we still are, was broad adaptability: hominins have been generalists for a long time. All this evidence from the hominin record suggests that chimpanzees may not be an especially useful starting point for study as a guide to the origins of human behaviour, let alone human morals. However, because that record is patchy, and there is as yet no irrefutable sign of its beginning, let’s accept, for the moment, that their behaviour does give a clue. How moral are surviving hunter-gatherers? Every anthropologist who has worked with surviving hunter-gathers[xi] has found that their social groups are always egalitarian. Neither highly dominant males nor females are tolerated for long. Boehm has not worked among such people, but has compiled a database from anthropological literature that codes a variety of social behaviours relevant to “social ideology, social control, cooperation and conflict” recorded by other researchers. He notes how altruism among hunter-gatherers goes far beyond “family” to embrace the whole group, and how much that is valued. He then considers how the socially predatory traits of violence and deceit, including murder, various forms of bullying, stealing, manipulation, lying, cheating, failure to cooperate and freeloading in general, are dealt with by such groups. Measures range from public gossip, ridicule, criticism and shaming by the group or individuals; ostracism and “sending to Coventry”; expulsion; physical punishment; and, in the last resort, execution. Bullies, cheats, manipulators, thieves and braggarts simply do not last long, and the whole gamut of sanctions are deployed either to keep them in check, to encourage them to change their ways or, in the most damaging cases, to eliminate them from the group. On the other side of the social coin, socially the most valued men – Boehm completely ignores the role of women in hunter-gatherer societies – are those who understate their achievements; as often as not the most modest in this respect are the most prolific contributors to the group. Groups overwhelmingly value aid to others within and beyond family; generosity; sharing and cooperation. Givers do not boast about their acts of altruism and neither ask for nor get thanks: social generosity is widely seen as merely “being human”! Most of us nowadays recognise such traits as top-rank, and they are far from uncommon. In fact most living humans anywhere on Earth often go further: kindness, generosity and hospitality extends to complete strangers and – in the case of charity – to those we have not even met nor ever will, and even to other animal species. “It’s what humans do”. This antithesis of alienation that shines through the muck that creates it is, I think, the essence of true human nature and essential to communism. Later, we shall see Boehm’s political take on this central human characteristic. Boehm claims that the altruistic ethos characterised every human group and most individuals, before the adoption of agriculture, herding and fixed abode around 10 ka ago (see end note 5). Most of us can agree with that view. But when that emerged from distant ancestral groups dominated by alpha males, bullying and theft, and how it did, are topics about which I frankly believe he is wrong. [i] A gene is a stretch of DNA (and occasionally RNA) that bears a code for RNA to carry in the manufacture of proteins by cells. It is an instruction for one of thousands of biochemical processes that comprise life. A gene is inheritable, as is all DNA in various chromosomes and mitochondria. In fact genes are identifiable stretches of DNA connected with basic instructions for general cellular functions. Such stretches occur in several alternative forms – i.e. with slightly different codes – that may produce different effects, such as eye colour or tolerance of lactose sugar in milk, but often show no detectable control over functioning of the whole organism. These variants, which are thought to have arisen through mutation, are termed alleles and are the central “characters” in genetic inheritance that are tested out in natural selection. Since the human genome was unravelled in the late 20th century, only a few functions of what constitutes the whole of human biology and behaviour have been connected to identifiable genes and alleles. As regards behavioural traits, a few extremes are suspected to be linked with identifiable alleles, but virtually none that are bound up in humans’ defining characteristic of conscious behaviour. [ii] Fitness in a Darwinian sense is the extent to which an individual member of a species and its descendants succeed in reproducing, thereby standing a better chance of passing on their complement of genes from generation to generation. In natural selection, genes that confer fitness are, in the long run, selected for when pitted against wider nature and less well-endowed individuals, so that such genes survive and the traits that they control become more widespread in the species. The converse concerns genes whose expression confers a disadvantage to an individual’s reproduction, so that those genes dwindle and eventually disappear from the population. Selection is for or against specific genes, depending on what they do in the broader context of the natural environment of the species in question. The various kinds of genetic mutation through which advantageous genes and their converse arise are at random and purely concern the simple code contained in molecules of DNA. Probably the majority of mutations make little if any difference; some may be immediately fatal or prevent reproduction; a few quickly confer fitness or its opposite; but the most likely course is that a “neutral” mutation is “conscripted” to some positive or negative role only after residing “dormant” in the genome for many generations when circumstances, in the widest conceivable sense, make that possible. [iii] Sociobiology assumes that conscious human behaviour has evolved in a social context through natural selection of alleles of genes that bear on behavioural traits, i.e. conscious behaviour is heritable. It is different from the inheritance of unconscious reflex or instinctive behaviour, such as the tendency of male cats to kill and eat kittens that are not their progeny, thereby accelerating females into fertility so that his genes can be passed on in a new litter that he has sired. A variant of genetic determinism, as promoted by Edward O. Wilson (Sociobiology: The New Synthesis) and Richard Dawkins (The Selfish Gene), sociobiology has been strongly criticised, specifically by Stephen Jay Gould (The Mismeasure of Man), Richard Lewontin, Leon Kamin and Steven Rose (Not in Our Genes) and Steven Rose (Lifelines). The standpoint of these critics is that differences in conscious behaviour arise from the human social environment and culture. Roughly speaking, that was the standpoint of Marx and Engels – although I suspect that, were they living today, they might consider that a dialectic relationship existed between human genetics and social being analogous to their historical materialism. I do not follow that through here, though incline towards the primacy of social being. [iv] The most recent estimates of divergences from common ancestry among apes, and remaining problems in how they proceeded are summarised in: Gibbons, A. 2012. Turning back the clock: slowing the pace of prehistory. New Scientist, v. 338, p. 189-191. [v] Ma is used as an abbreviation for million years. Similarly ka is used for thousand years. [vi] In evolutionary biology, parsimony is the adoption of the simplest assumption in formulating a hypothesis; similar to Ockham’s “razor”. [vii] Sexual dimorphism is a noticeable difference between males and females of the same species: in anatomical shape, size, ornamentation and/or behaviour. [viii] That is not to imply that humans are exclusively monogamous for life. Gibbons, which are, show little difference in stature or bulk between males and females. For more information on sexual dimorphism see Roberts, A. (Ed.) 2011. Evolution: The Human Story (hardback). Dorling Kindersley: London. ISBN-13: 978-1405361651. [ix] An excellent, well illustrated and easily read summary appeared in a recent issue of Scientific American (Harmon, K. 2013. Shattered ancestry. Scientific American, v. 308 (February 2013 issue), p. 36-43). More comprehensive is Chris Stringer’s book (Stringer, C. 2012. Origin of Our Species (paperback). Penguin Books; ISBN-13: 978-0141037202). See also a brief account in Earth Pages. 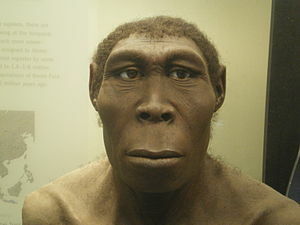 [x] Early in the search for human ancestors in East and South Africa, one genus became the focus during the 1950s and 60s – Australopithecus (“southern ape”). Louis and Mary Leakey unearthed two kinds of fossil, one more delicate or “gracile” the other extremely “robust”, especially in the cranium and jaw. The first stayed in the genus Australopithecus but the other whose massive teeth and jaw muscles clearly indicated a radically different lifestyle was dubbed Paranthropus’ – for details see Roberts op. cit. [xi] The term “hunter-gatherer” is perhaps too prescriptive for those groups still living outside settled agricultural communities or those who herd animals. Some are better described as foragers, especially those who subsist along the coast or in areas where there are no large game animals. Importantly, nowadays both kinds of group live at the margin of other surplus-producing societies, are often oppressed by those neighbours and no longer have the freedom to roam wherever they please, as did humans before about 10 ka ago. Their cultures are almost certainly a shadow of what was once that of every human. Inevitably, to rely on records of the culture of these last remaining hunter-gatherers and foragers to reconstruct that of every pre-10 ka human group has many drawbacks. Boehm’s work primarily says our humanness arose in socially negotiating band insurance among foragers in unpredictable environments. The review notices this and says it is sociobiology. MISTAKE. And then goes on tedious automatic once ‘alienation’ pops up. The first alienation was by priests, through tithes, then taxes, and latterly by profit… and even if it happened the other way around…. it all happened several tens if not hundreds of thousands of years after the egalitarian revolution by hunter gathers in overthrowing alphadom. Indeed the regrettable re-instatement of alphadom by stratified societies was only possible by the niches (agricultural and industrial) opened up by the social negotiation of foragers in their social search for stability (Boehm considereds this a type of group selection but I feel this is a mistake)…. such that thinkers such as Burke think the regression is of an organic nature…. but the egalitarian revolution is always with us, oedipal some days, consensual the next.